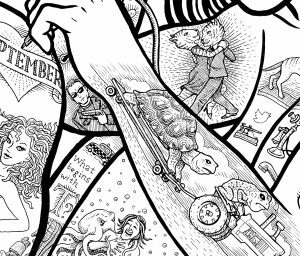 In October 2016, Gregory Nemec set himself the task of creating daily pen and ink drawings. Each day, Nemec posted his latest drawing to social media and got recommendations from friends for upcoming subjects. He also used prompts from Instagram and researched new topics. This form of collaborative creating led to, as he puts it, “art that wouldn’t have existed any otherway.” The twelve resulting illustrations are displayed at Arc Stages’ Schiffman Butterfield Gallery in Pleasantville through February 24. Nemec’s work has appeared in The New York Times Book Review, The Wall Street Journal and more.